What most people don’t think about is that kids that have siblings facing cancer still have to face expectations and normalcy. They are expected to go to school, be good friends, maintain their grades and participate in their team sports. Those are extremely high expectations during a time of unimaginable heartbreak. Yet, that is what society expects. They have to live in the dark shadow of cancer and they have to face their fears and worries daily. My kids had to watch their baby brother suffer through chemo treatments for a year and all of this without the consistency of having both of their parents around. Yet, after all of that pain, their main concern has continued to be for each other and for their parents, through it all. 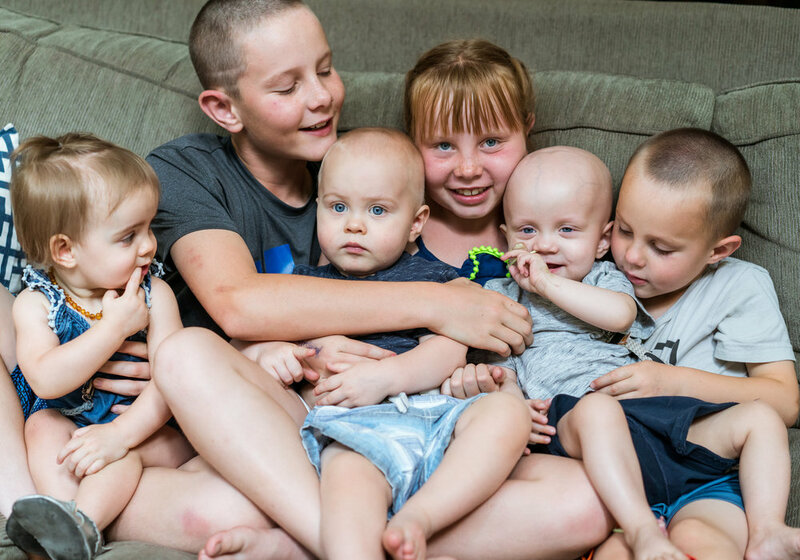 So, in hopes of shining a light on the overlooked siblings, the unseen heroes of childhood cancer, I put together a list of things you can do to help these kids during their difficult battle and beyond. I would imagine this list would help any family going through special medical needs with one of their kids. Set aside special time: Since parents understandably tend to focus on the pediatric patient during treatment, setting aside special time for parents and the other children only can be very meaningful. Even if parents spend just an hour of one-on-one time with each sibling, it can alleviate natural feelings of exclusion and preferential treatment. Maintain sense of normalcy: this was huge for Steve and I. We never wanted the other kids to feel resentment towards Hayes. Their world was already knocked upside down, the least we could do was still allow them to feel one area of normal. So we made sure they were at every dance class, every baseball game and every play date. Involve siblings: Actively involving siblings in the pediatric patient's treatment process is important. I found that my older kids especially felt helpless. Allowing them to help me “flush” his lines and change his dressings helped them feel like they were helping Hayes. It also helped them maintain their close relationships with Hayes. Communicate and provide information: Family communication is one of the most important aspects of a siblings cancer journey, in my mind. We were honest with the kids from the beginning. Opening up about the struggles and celebrating the successes with them. You of course have to explain things on their age level. When Hayes was first diagnosed, we sat the kids down and explained cancer as a weed. Likening it to a weed and referring to chemo as the weed spray. We needed to do everything we could to “kill those roots”. This example helped the kids understand cancer on their level. Allow siblings to express themselves: Giving siblings the opportunity to tell their fears and worries, helps them to process what they are facing. I never wanted my kids to feel like they couldn’t talk to me. I found myself asking them often, “How are you feeling about Hayes?” It opened up those lines of communication for us. Seek support: Establishing a social support system for siblings is very important. Arranging for them to spend time with friends and other family members less directly involved in the patient's care can be extremely comforting. It gives them an outlet where cancer isn’t at the forefront. Arrange for hospital visits: Giving the kids exposure to the hospital allows them to feel like they are a part of the journey rather than the outsider. They can talk to the doctors, nurses, child life specialists and be able to see first hand that their sibling is safe and comfortable. Love them: Letting them know that they are just as loved and valued as the child who is sick is obviously very important. But unfortunately, it is common for these siblings to feel like they are less important than their sick sibling.